The Protection of the Mother of God is one of the most beloved feast days on the Orthodox calendar among the Slavic peoples, commemorated on October 1. The feast is celebrated additionally on October 28 in the Greek tradition. It is also known as the feast of the Virgin Mary's Cerement. In most Slavic languages the word "cerement" has a dual meaning of "veil" and "protection." The Russian word Pokrov (Покров), like the Greek Skepi (Σκέπη), has a complex meaning. First of all, it refers to a cloak or shroud, but it also means protection or intercession. For this reason, the name of the feast is variously translated as the Veil of Our Lady, the Protecting Veil of the Theotokos, the Protection of the Theotokos, or the Intercession of the Theotokos. The feast day celebrates the appearance of the Mother of God at Blachernae (Vlaherna) in the tenth century. At the end of St. Andrei (Andrew of Constantinople) Yurodivyi's life, he, with his disciple St. Epiphanius, and a group of people, saw the Mother of God, St. John the Baptist, and several other saints and angels during a vigil in the Church of Blachernae, nearby the city gates. The Blachernae Palace church was where several of her relics were kept. The relics were her robe, veil, and part of her belt that had been transferred from Palestine during the fifth century. The Protection is commemorated most fervently in Slavic churches, probably because St. Andrei was a Slav. The first celebration of the Theotokos's cerement in the Russian Orthodox Church dates back from the 12th century and today is celebrated throughout the Orthodox Church. Among these churches two that are world famous are: in Moscow, the Cathedral of Intercession upon a Moat (Russian: Храм Покрова "на рву," Cathedral of the Pokrov upon a moat), which is popularly known as the St. Basil's Cathedral and in Bogolyubovo near Vladimir, the Church of Intercession upon the Nerl River (Russian: Церковь Покрова на Нерли, Tserkov Pokrova na Nerli). In recent years, the Feast of the Protection has become associated with thanksgiving for the deliverance of the Greek nation from the Italian invasion of 1940. These events are commemorated in Greece in a national holiday known as "Ochi Day" or "No Day," referring to the response of the Greek leader Metaxas to Mussolini's ultimatum. The Ecumenical Patriarchate also provides for this usage in its parishes in Greece and in the Greek diaspora, and it is generally observed now throughout the Greek-speaking world. The observance includes the chanting of a Doxology incorporating hymns recognizing the Protection of the Theotokos over the Greek nation, as well as the kontakion "O Champion Leader." 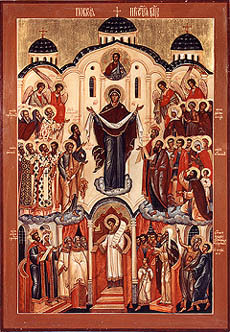 Below the Theotokos, in the center of the icon, stands a young man with a halo, he is clothed in a deacon's sticharion. In his left hand, he is holding an open scroll with the text of the Kontakion for Nativity in honor of the Mother of God. This is St. Romanus the Melodist, the famous hymnographer whose feast is also celebrated on the same day, October 1. He is with his choir attended by the Emperor Leo the Wise together with the Empress and the Patriarch of Constantinople. ↑ Great Synaxaristes: (Greek) Μνήμη Ἁγίας Σκέπης τῆς Ὑπεραγίας Θεοτόκου. 28 Οκτωβρίου. ΜΕΓΑΣ ΣΥΝΑΞΑΡΙΣΤΗΣ. The Miracle of the Virgin Mary at the Church of Blachernae in Constantinople in 911 A.D. The Protection of the Mother of God. Wikipedia. This page was last edited on March 22, 2013, at 13:47. This page has been accessed 77,097 times.